College Welcomed Distinguished Neurologist Oliver Sacks to Speak on "Identity"
The NSU community was invited to join the Farquhar College of Arts and Sciences Division of Social and Behavioral Sciences in welcoming Oliver Sacks, M.D., to Nova Southeastern University, as part of the Distinguished Speakers Series. The event took place on Thursday, April 19, 2007, from 7:00-8:30 p.m. in the Miniaci Performing Arts Center. Sacks is the author of numerous bestselling books, including Awakenings, The Man Who Mistook his Wife for a Hat and An Anthropologist on Mars. His memoir, Uncle Tungsten: Memories of A Chemical Boyhood, was named one of the best books of the year by The New York Times Book Review. Through his storytelling, he has transformed our understanding of the human mind and restored narrative to a central place in the practice of medicine. In 1966, Sacks encountered a group of survivors of the "sleeping sickness" epidemic that killed millions in the 1920s. Frozen like human statues for decades, these men and women were the victims of a forgotten disease that had long since been considered untreatable. After administering the experimental drug L-dopa, Sacks saw them awaken with "an explosive quality, as of corks released from a great depth." His bestselling book about their experiences inspired the feature film Awakenings (starring Robert De Niro and Robin Williams), which was nominated for an Academy Award for Best Picture. Sacks' writing demonstrates "the freedom and potential of the human spirit against a physiological fate." With profound compassion and ceaseless curiosity, Sacks transports us into the uncanny worlds of his neurological patients, such as the surgeon who performs delicate operations despite the compulsive tics and outbursts of his Tourette's syndrome; the artist who loses the ability to see, or even imagine or dream, in color; and the woman with Alzheimer's who cannot identify people and objects by sight but uses music and color to order her world. In his stories of individual patients adapting to and surviving various neurological conditions, and in his brilliant explorations of the nature of perception, memory, consciousness and creativity, Sacks enlarges our understanding of the complexities of the human mind. 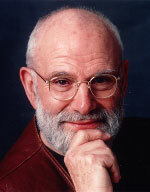 Sacks is a practicing physician and a frequent contributor to The New Yorker and The New York Review of Books. His books are used in universities worldwide, in subjects as diverse as medicine, writing, psychology, bioethics, philosophy, chemistry and religion. He has received numerous literary and medical awards, including grants from the Guggenheim and the Alfred P. Sloan Foundations. Sacks is currently working on a book about music and the brain, to be published in fall 2007. The topic of Sack's presentation related to the Farquhar College of Arts and Sciences's 2006-2007 academic theme of "Identity." Throughout the year, the college explored the various meanings and implications of "Identity" through a range of interdisciplinary programs and activities that focused on insight from the humanities, social sciences, and physical sciences. In addition to campus visits by Sacks and other distinguished speakers, the college designed special courses around the theme and incorporated it into the theatre program's season, student-faculty reading groups, and faculty lectures.